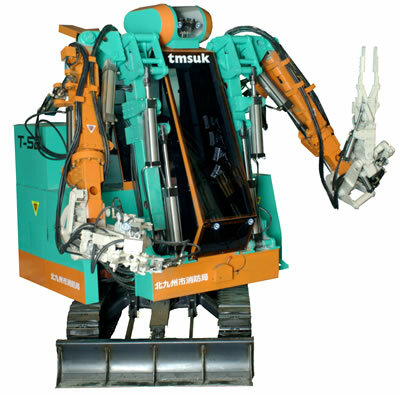 Enryu, a rescue robot capable of lifting steel girders and tearing the doors off cars, was demonstrated to the press yesterday. 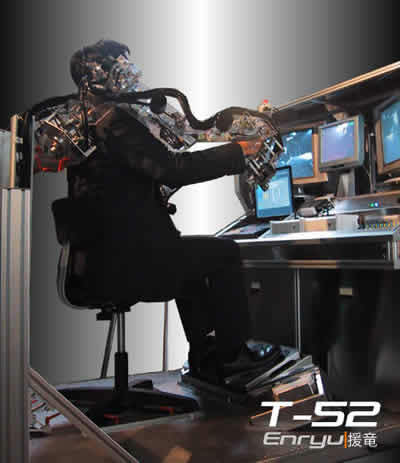 The robot is guided by an operator who wears a telefactoring gauntlet; the robot arms mimic the actions of the human operator. Science fiction fans know that the telefactoring device, or waldo, was invented by Robert Heinlein and featured in his 1942 story Waldo"
Read more about Search and Rescue Robots; also, go see Enryu Rescue Robot in Action. Watch the brief (1.5 Mb) Enryu Robot Removes Car Door video.